What’s better than BBQ and pie? How about when the pie is arguably better than the BBQ? This was the thought running through my mind upon tasting First Prize Pies S’Mores Pie ($6/slice) last week at Fatty Cue. All of the Southeast Asian-inspired BBQ was spot on, but when someone can take a foolproof recipe like S’Mores and make it better, it’s time to rejoice. Creator Alison Kave’s recipe features a tightly packed, buttery graham cracker crust which provides a crisp, crumbly and slightly salty shell for a layer of creamy Belgian Callebaut milk chocolate ganache crowned by sticky and pleasingly burnt homemade marshmallow fluff. It’s the dessert dreams are made of. Kave’s culinary prowess is no accident. Her brother is Corwin Kave, executive chef at Fatty Cue, and her mother is Rhonda “Roni-Sue” Kave, of Roni-Sue’s Chocolates, home to NYC Food Guy’s favorite bite at the Hester Street Fair: the red velvet truffle from Roni-Sue’s new Bake Sale collection. But enough about Mom. 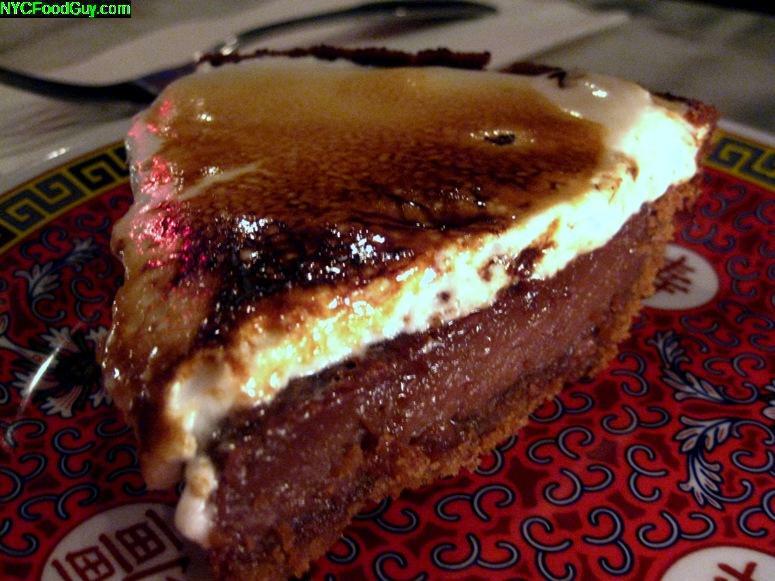 You need to go try her daughter’s S’Mores Pie which you can find at Hester Street Fair, Fatty Cue, Saturday at Roni-Sue’s Chocolates, Sunday at God Buns Market (next to Fatty Cue), or on the First Prize Pies website. useful food blog, i saw you on TV, keep up to date. time as you amend your web site, how can i subscribe for a blog site?